The 2015 League of American Bicyclists’ state rankings were released in May and Utah moved into the top five overall and into the number two slot in the west (see our June 2015 issue for the full story). Much of the ranking is based on five emphasis areas: Legislation and enforcement; Policies and programs; Infrastructure and funding; Education and encouragement; and Evaluation and planning. In 2015, Utah increased its ranking in three of the five assessment areas. Utah’s points increased from to 53.7 in 2014 to 54.3 in 2015. It is first necessary to acknowledge that these rankings are relative. The application for the Bicycle Friendly State ranking is not a static document. Each year changes are made to indicate advancements in each of the five areas of assessment. One of the most notable changes in the 2015 application was the increase in questions relating to eBikes and associated eBike legislation. The overall ranking serves as both a benchmark to recognize bicycle related advancements, but also as a roadmap to become more bicycle friendly. An increase in points and ranking are both a good indicator of forward progress and recognition of the hard work of many individuals and agencies. However 54.3 points out of 100, indicates that there is still substantial work to be done in order to make Utah a safe place in which to ride and one in which people do so more often. Even perennial first-placed Washington scored only 66.2 points. The feedback portion of this report card (discussed below) provides the best next steps for states to advance their ranking and bicycle friendliness. 1% or more of people commuting by bike – There has been a notable increase in the number of people riding bicycles all across Utah. However, commuting is the key word in this assessment. This 1% figure is based on the US Census Bureau’s assessment of commuting, which only accounts for the mode of transportation taken on trips to and from work. Commuting for work purposes makes up only 16% of all trips. Initial research is indicating that bicycling and walking trips are drastically undercounted as part of this metric. However, this is the measurement that is taken. The way forward: Ride your bike to work. If you already ride to work, encourage and support people in your circle so they can do the same. 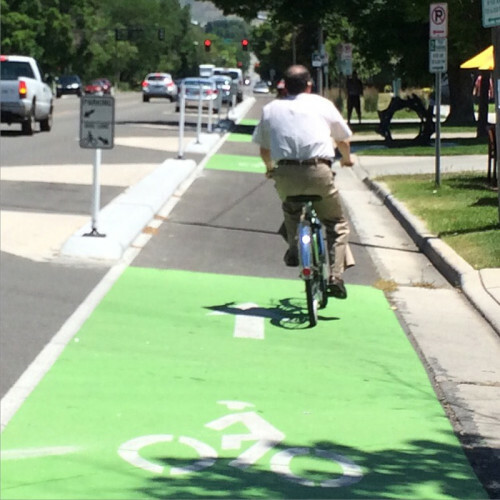 Complete streets policy – Currently, UDOT has what is classified as an “accommodation policy.” This accommodation policy seeks to include bicycling and walking elements when feasible. A complete streets policy is one in which bicycling and walking elements must be included and only excluded through a documented process with high standards. The way forward: Bike Utah is currently working with UDOT to develop a structure so bicycling infrastructure is more rigorously assessed for integration into projects. There may be opportunities in the future for citizens to be involved in this process. We will keep you posted. 2% of more federal funds spent on bike/ped – Utah does not have a dedicated source of active transportation funding. However, our partners at UDOT have been integrating bicycle and walking components into their projects without accounting for the estimated funds spent on active transportation. The way forward: Bike Utah is working with UDOT to determine how they can account for the actual percentage of federal funds being used for active transportation within their projects. There are certain key areas which Bike Utah is targeting from this feedback in order to make our state more bicycle friendly while, at the same time, increasing our ranking and increasing Utah’s bicycle related exposure. LAB Recommendation: Conduct a bicycle economic benefit study to showcase the positive impacts of bicycling for tourism, health costs, economic development, job creation, and transportation return on investment. The way forward: Bike Utah is working with our partners to commission a study quantifying the economic, environmental, and health benefits that bicycling and walking brings to Utah. LAB Recommendation: Disburse SRTS funds. These have not been distributed for projects over the past two years and, to date, no RFP has been issued for 2015. Create and fund a school-based bicycle education program. The way forward: Bike Utah reached out to UDOT early in 2014 regarding why the Safe Routes to School funds had not been distributed over the previous two years. As a result, a portion of these funds has been redistributed to the metropolitan planning organizations for reintegration into the Transportation Alternatives Program, which will lead to more active transportation projects. Bike Utah is in the process of developing and pilot testing a school-based bicycle education program. LAB Recommendation: Adopt a statewide Complete Streets policy. The National Complete Streets Coalition has a model state policy and a variety of other resources to ensure adoption and implementation. The way forward: Bike Utah is working to create a system where bicycle projects are more rigorously assessed as part of UDOT’s project development process. Overall, Utah is headed in the right direction. There are numerous projects in the works to advance bicycling and confidence is high that Utah will continue to expand upon past successes. The process of change is not always as rapid as we would like, but this effort is a double century and not a match sprint.